I’m back! But not quite on the Chronic Kidney Disease mark yet. 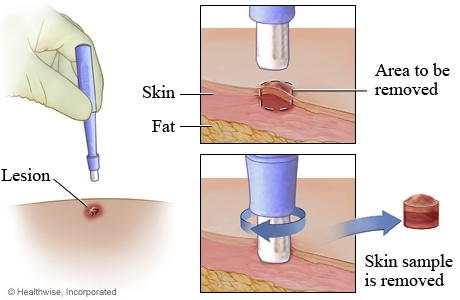 The doctor usually finds some little skin tags that can be snipped off so they don’t get in my way or some suspicious mole to be scrapped off so it doesn’t turn into cancer later on. This time was a little different. Dr. Crystal Layton of Affiliated Dermatology here in Phoenix is a soothing, easy to talk to doctor. And we did talk. She found a couple of lesions that looked suspicious to her and asked my permission to freeze them off. I never agreed to anything so quickly before (except maybe co-habiting with Bear). 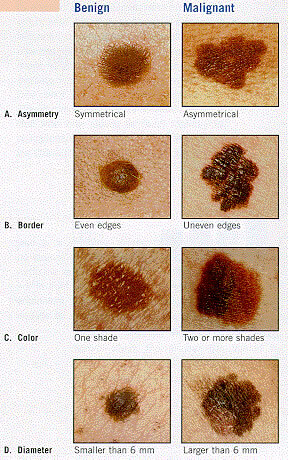 The images of different melanomas are provided by sunsafekids.tripod.com. The procedure is called cryosurgery which Dr. Layton’s medical group defines as “the treatment of lesions with the application of a cold substance. In most case, liquid nitrogen is used to destroy the lesion.” Cold vastly understates the actual feeling. Lesion sounded like a dirty word to me so I looked it up. The second definition of the word on The Free Online Dictionary is “A localized pathological change in a bodily organ or tissue.” *sigh* That helped. While blisters did form as my dermatologist warned me they might, the one on my face is (thankfully) dried up and gone while the one on my leg is in a slightly uncomfortable holding pattern after eight days. I’ve always believed in not sweating the small stuff and this is small stuff in comparison to what happened next. You guessed it. One week after losing a family member to breast cancer, I had not one, but two, biopsies. Being an eternal optimist, I was not even thinking about the possibilities this could bring to mind until I got the results. I’m great at acting immediately when necessary but also great about waiting until there is a necessity instead of going off half cocked (so glad Bear gave me a gun education when we met so I could comfortably use that term). This may be a little hard to believe but just as I was about to hit the publish button on the blog site, my internet went down. I immediately got a call from the dermatologist’s office telling me the biopsy came back benign (harmless)… and the internet came back up. Wow! The area was numbed so I could have watched the process if I’d cared to (hah!). I am a firm adherent to recent research findings that NOT watching a medical procedure lessens the patient’s pain (none here) and anxiety (well…). I attempted to take photos of the bandages myself, but the results were laughable. See, I can find humor in anything. Dr. Layton performed a punch biopsy, and I’ve got the three stitches to prove it! The stitches don’t bother me a bit since the pressure bandages protect them. Depending upon which source you check, pressure bandages are used to stop bleeding (if I bled, I didn’t know about it) or to prevent fluid from accumulating in the wound. Unfortunately, the keloids (extra scar tissue formed over a wound) from biopsies in the same area twenty years ago may now have keloids of their own. I actually saw the ‘plugs’ that were removed from my breast. It’s not something a doctor usually offers to show you, but since all my questions were answered as I asked them, I figured I’d ask to see the plugs. And they were shown to me. Oh, thank you to ehealthimages.com for the diagram. I simply can’t think of a smooth transition into book news. I am so delighted with the biopsy results. So I will just switch. Sales are growing which was a surprise to me since I hadn’t bothered checking. 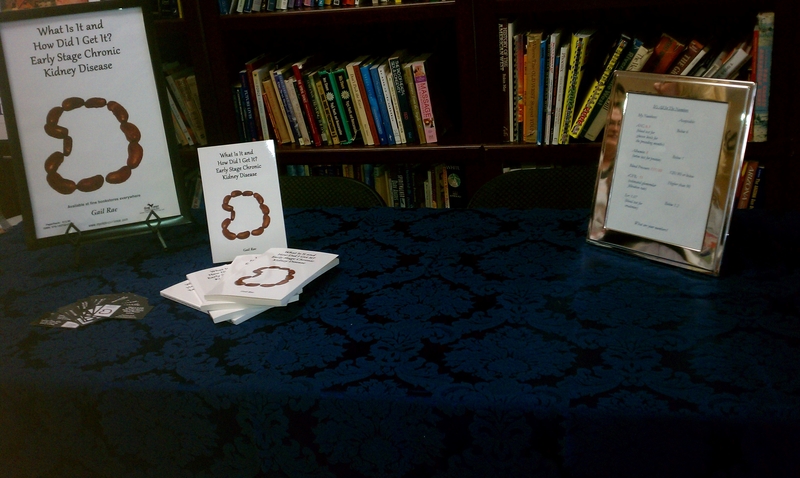 I’ve also gone back to donating to doctors’ offices and anywhere else people might find the book helpful. Have you read my FB and Twitter offer to send you a free book when you donate to any kidney affiliated organization? I still maintain it’s more important to get the information to people when they need it, where they need it, than make a million dollars. I wouldn’t mind recouping my expenses, but the book was never meant to be a money maker for me. It is exhausting writing about your own health issues!